In the Internet marketing world, Google has created a powerhouse with its business apps. These tools can help any organization make the most of their online advertising dollars, such as Google Ads, which helps companies boost their Search Engine Optimization (SEO) and achieve higher rankings. However, too many companies end up losing out on the opportunity presented by tools like Google Display Ads because they don’t understand how to fully utilize the options presented. Google Display Ads is a particularly useful option for businesses of any size because it provides an opportunity to reach a larger audience by having advertisements displayed on blogs, news sites and a variety of other niche web pages where you can reach your target audience. With over 4.38 billion internet users across the globe, reaching them while they browse online can prove to be a lucrative opportunity for any business. Yet, one of the biggest misunderstandings that marketing strategies make is ad size. Selecting the correct Google Display Ad dimensions is crucial to a successful internet marketing campaign. What is the need for Correct Dimensions? In the online advertising world, the dimensions of the display ads have been developed with different purposes and uses in mind. Because the size of the ad can impact how a user sees it — or even if they see it — it is important to have an understanding of how to decide on the right dimensions for your ad. If you try to create a display ad without a solid understanding of how it will appear on different screen sizes, you could jeopardize your organization’s marketability. For example, Google Display Ad dimensions that work well on a computer or laptop often don’t fit on a smaller mobile device. Thus, if you select dimensions that are not specified by Google, your display ad is likely to be ineffective. When you have a better understanding of Google Display Ad sizes and dimensions and how they fit into the bigger internet marketing picture, you will be in a good position to create ads that convert. Ultimately, the goal is not just to be seen by a large number of eyeballs, but rather to get consumers to click through to your site and turn them into customers. While it may be tempting to simply create the largest display ad that you can, this is not always the best way to reach your target audience. Rather, seek the advice or assistance of a qualified, professional marketer who can research the best Google Display Ad dimensions for your marketing purposes. Even though it may seem that there are minor differences between the ad sizes, these differences can actually prove to make your display ad more effective. 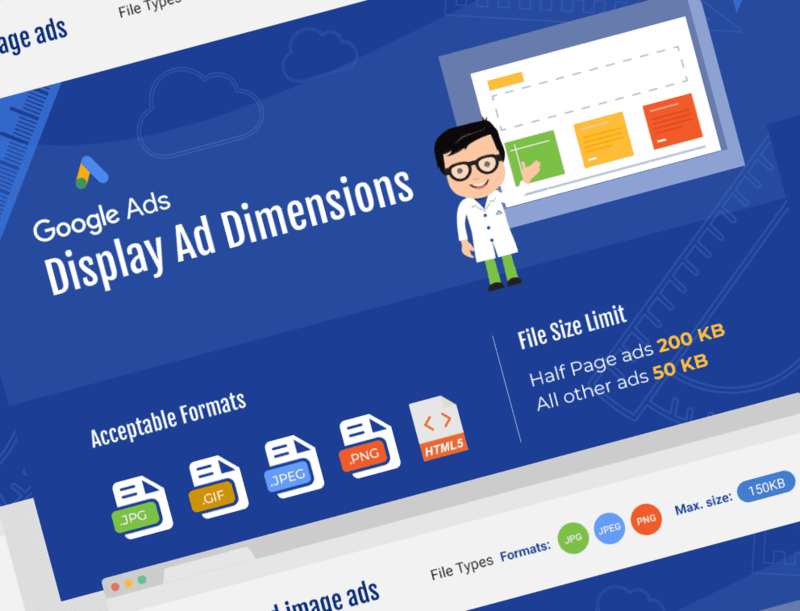 With this Ultimate Google Display Ad Dimension graphic, you will be better equipped to understand the differences between ad sizes and create better ads. Google recommends five different sizes as its most popular choices for display ads. These include the 336x280 large rectangle, the 300x250 medium rectangle, the 728x90 leaderboard, the 300x600 half page, and for smaller screens the 320x100 large mobile banner. Although their advice is useful, it still may not be the right size for your ad. Because the dimensions of your display ad are crucial in getting the attention of your target audience, we have developed a comprehensive guide to help you. In order to get your ads on the Google Display Network, you need to meet certain standards that the internet giant has set. This is where below featured ultimate guide to Google Display Ad Dimensions can help. The tool allows for various different ad dimensions but does limit the file size and format. Organizations looking to reach a niche audience will need to do some research on the ad sizes that work best in that market. With Techwyse's guide, you are able to see and compare the different ad dimensions and placement on the web page. 300 x 250 medium rectangle: This ad size gets the most attention when it appears either within the content on the page or at the bottom. 336 x 280 large rectangle: As with the medium rectangle, the large rectangle does best when it is between the text on the page or at the end. Because it is larger it allows for more ad inventory. 728 x 90 leaderboard: Leaderboards are ads that have been sized to fit on the top of a page, before the main content. 300 x 600 half page: Half-page dimensions are a good size for organizations that really want to get their message noticed. With these ads, there is more pressure to create visually stunning graphics. 320 x 100 large mobile banner: Although smaller screens can be a challenge for ad creators, the large mobile banner size has become a top option because it is twice as tall as the mobile leaderboard and draws the attention of the user. To design an effective online ad, you need to have a good understanding of display ad dimensions and how they work in the advertising world. You should also know how they appear on different screen sizes. Building a Google Display Ad with the correct dimensions can help your company get noticed in the overcrowded world of online marketing. In fact, it can be the difference between creating an effective ad that is able to convert viewers. With this Ultimate Guide to Choosing the correct Google Display Ads Dimensions by TechWyse, you will be equipped to design an Internet ad that best fits your marketing campaign and will get you the results you’re looking for.